Prevents damage to hardscapes, foundations and sidewalks from overgrown tree roots. NDS provides solutions which span both residential and commercial applications. NDS provides a number of innovate products to redirect and contain tree roots. Linear barriers are a dependable solution for varying applications and provide varying heights which can be connected easily with a dependable built-in connection joint. Root barrier sheet material from NDS is unique to the industry and provides protection from water as well as tree roots. Available in 20 foot sheets of varying heights, it can be cut to any length. Built-in vertical slots direct tree roots downward away from damageable hardscapes, sidewalks and foundation. Designed for small root zones, root barrier planters provide an effective barrier solution which can be installed quickly in a 30" augured hole. Root barrier planters are built heavy duty and are designed for both residential and commercial use. Landscapes and hardscapes can be a big investment. The traditional methods of implementation take effort, time and a hefty price tag. However, with a one-time installation of root barrier control system years of security are gained with minimal installation time and all at an affordable price. If unwanted weeds and roots are left to grow, damage often occurs to landscaped areas and hardscapes from uncontrolled overgrowth. The constant maintenance of these roots and weeds can be a thing of the past and can be eliminated with the use of a root barrier system. This allows for one’s own personal time and budget to be used on more important areas rather than consistently fixing or repairing damaged landscapes and hardscapes or digging out and clipping roots. Root barrier directs the growth of roots from trees and shrubs downward. This dramatically decreases the potential of roots penetrating nearby buildings, walls or hardscape foundations. Using this barrier for commercial and residential landscapes has already protected many communities against the expensive repair costs of buckled driveways and sidewalks, as well as cracked foundations. What is the Cause of the Overgrown Roots? Large trees and shrubs need substantial amounts of water to grow and sustain life. When the soil dries out around the root, expansion takes place in various directions in order to find moisturized soil. 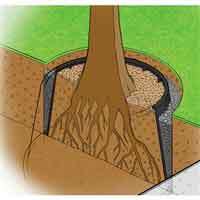 Until roots find moisture they will continuously expand and will even penetrate foundation walls and cement patios. There are many trees that require large amounts of water even in normal rainfall conditions. The barrier directs the overgrown and expanding roots downward in order to prevent damage to nearby structures. The damage caused by overgrown and expanding roots can be costly. Expensive repairs and renovation are then required to improve the landscape. However, if a barrier is applied damage to the area is kept at bay. For the past several years, the “cut off wall” solution has proven to be fairly effective. A cut-off wall is used as a vertical root barrier. It measures 3 feet from its footings. The cut-off wall can prevent the movement of roots, stabilize the soil, and control the expansion of clay. It is made from a 11” reinforced concrete trench that has a depth of 5' to 15'. The cut-off wall is very expensive to build and sometimes fails due to the fact that it is made from concrete just like the hardscapes and building foundations which tree roots routinely damage. The most effective and inexpensive root barrier is a pre-manufactured product. This is considered the most cost-effective way to prevent the moisture stabilization and overgrowth of roots from creating damage. This root control system is made from heavy duty polypropylene with a 40 – 60 mil thickness. It is designed to be a sturdy and impenetrable barrier against the growing roots. 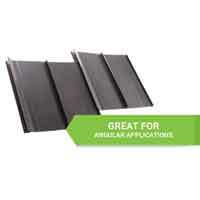 It also prevents the stabilization of moisture and development of excessive dampness from the soil. Planter Barrier – This root control system is made from a one-piece, pre-molded, tampered HIPP root planter barrier to achieve superior strength. This type of barrier guides the tree roots downwards, out of flanged base. The main advantage of this type of root barrier is that is eliminates the gluing, cutting, and measuring of panels that typical of other root control systems. It's main limitation is it's size as it can only be used to contain roots from a single tree. Sheet Material Barrier – This root control system is manufactured from durable HDPE or High Density Polyethylene. It helps to retain dampness in the soil, preventing root movements which can cause expensive damage to hardscapes and other nearby structures. This root barrier measures 20ft long, which is ideal for linear planting style application. If necessary, the length can be cut to achieve the desired measurements. It can also be applied to individual planted trees. 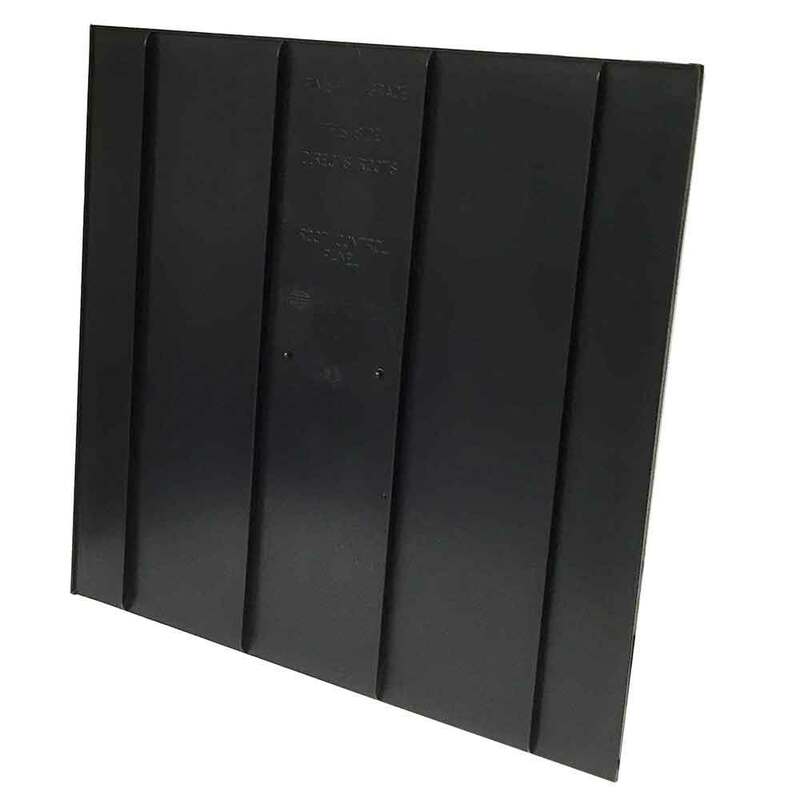 The EP Barriers – This is an injection molded HIPP (High Impact Polypropylene) root barrier modular panel. The EP series also includes a joining strip which allows for multiple panels to be joined together. This also has “T” top edge which helps in preventing the overgrowth of roots. It also has external flanges at its base in order to lock the panel in the ground.